"I'm a first time mom and y daughter is 5 months old. I've been back to work about a month, at 3 days a week. So far, it's been ok. I love my nanny and Genevieve seems happy and healthy in the current situation. I enjoy being back at work and using my brain. I know what I'm about to type is the same scenario every working mom faces, but I just need to know — how do you do it? I have to go back full-time in January. This is something I just can't wrap my head around. Right now, I'm still with her more time than not, but soon, she'll be spending most of her time with someone else. A wonderful someone else, but still — not me. And that someone else will be teaching her to eat solids, teaching her songs and words, will most likely see her crawl first, clap first, wave first, walk first. Just typing that brings tears to my eyes. How do I wrap my head around this? How do I make it ok? How can I cram a full day of love and interaction into the hour and a half between when I get home and when she goes to bed? How do I feel like I'm the one raising her, not the nanny? How do you do it?" - Can you arrange to work from home at least one day a week? - Break your vacation days into single days off taken once per week (or even half days?) and spend them with your daughter. I feel like at this young age better to have more time with mommy within a week, then two full weeks within a year. 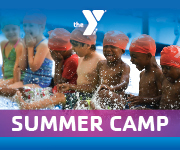 - Enroll in classes (music, swim, baby yoga) to discover more exciting ways to bond with your baby. - Keep breastfeeding if you can ... your baby will recognize you by the smell and feel the closeness. 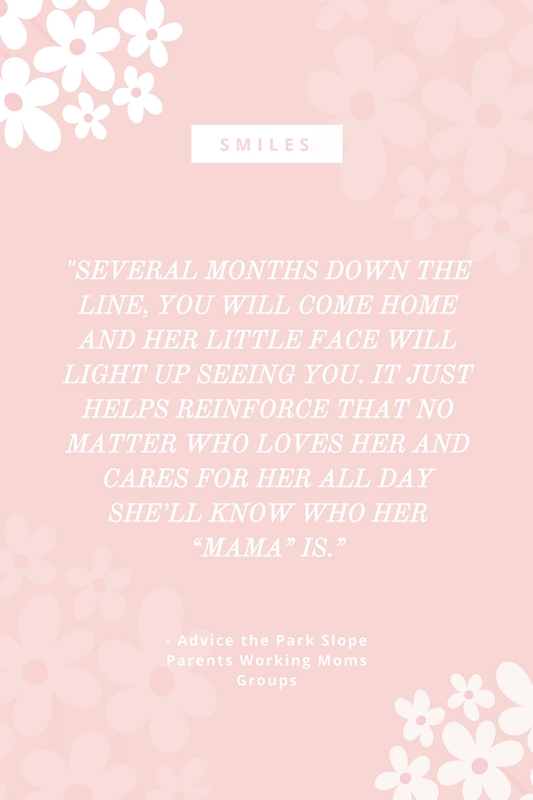 - Take good care of yourself and rest enough so that you have the physical and emotional resources to interact with your daughter when given a chance. - Ask the nanny to share photos and videos during the day. - Where possible, introduce new things (e.g. new flavors of solids) on weekends when you are around. Accept that some things will slip through the cracks (hard to fully control what the nanny does), prepare to let go. - Focus on how you can make the little time together more meaningful. Whatever you feel makes you two bond (singing, unstructured play on the floor, baby yoga, dancing in front of a mirror together, finger painting, making a mess in the pantry ... whatever brings a smile to that precious little face). - Plan fun weekends together (we’ve just tried a zoo and my son loved it!). A farmers market or Christmas fairs may be another good idea. If you have to run errands, take your baby in a carrier everywhere. - Not sure if it helps, but separated fathers get to see babies 2-3 times a week for 2-3 hours. Those who want to, are still able to develop a lifelong relationship! Having a supportive and flexible employer was important too. I worked for a Fortune 100 company but one that was extremely flexible with working moms. I left at 5:30pm on the dot every single day and was able to work from home on Fridays. Working from home was really key to balancing being back at work full time. Is this something you might be able to do? [My daughter] was a late evening sleeper from when she was an infant. Her natural bedtime is between 9pm and 10pm. I know that it is much later than what most parents feel is normal or preferable. However, she also woke up later, making her total number of hours slept totally up to averages. Also, until a child is in daycare or school, it doesn't really matter what time the go to bed if they are making it up by sleeping in - this is just my personal opinion. This later bedtime gave us an opportunity for more time together in the evenings. Yes, my husband and I had less time for ourselves in the evening but we loved spending time with Mina after we got home. If your child's bedtime is much earlier, you can consider moving it even if by just 30-60 minutes. It can allow for that much more happiness/quality time. Outsourcing things like apartment cleaning, not worrying about elaborate dinners helped me have more time for [my daughter] when I got home and on weekends. Our nanny was amazing in everything - taking care of [my daughter] but also setting appropriate boundaries. I fully realize that she may have been the one who saw my daughter do things for the first time. But you know what she did - she never told me. She let me and my husband enjoy the precious moments as ours whenever our daughter did these things in the evenings or on weekends, so we could claim them as our own. It is a simple thing but is a big reason why I never felt like I was missing these milestones. I thought I would be at the office early every morning because I thought that's what parents did -- we're up anyway, right? Instead, I spend more time in the mornings than in the evenings with my boys. I like to stay and chat with our nanny and play with her and the boys while we go over how their night went, their development, etc. It makes me feel much more involved. When I get home in the evening, usually either my husband has already relieved the nanny or I get home right about when it's time for her to leave, so I appreciate this time with her and them. Unless I have an early morning meeting or something, I typically stay home until they go down for their morning nap. I don't know if your work schedule has any flexibility, but if I had the option of spending quality morning time with them but missing their fussy evening time, I'd pick mornings! Either way, if you can have a chunk of time with [your child] and the nanny, I find that really helps me. Sometimes I tell our nanny that I noticed one of them doing something for the first time and she smiles in a way that makes me think he's been doing it for a while, but not in front of me. I don't really mind as much as I thought I would because, in all the chaos of our lives, there's no telling when the 'first' time they did something was anyway. For example, one of them just started clapping, but for all I know he's been doing that in the crib, when I was in the bathroom, at his brother when he does something funny but I wasn't looking, etc. I've also noticed they are most adventurous when they think no one is looking -- for example, I rarely actually see one of them crawl, but I know he can because when I leave the room and come back, he's moved totally across the room. So chances are good I'd miss plenty of 'firsts' if I was home all day, anyway. And their look of immense, beaming pride when they pull to stand has not gone away -- I have no clue when the first time they did that was, but it was a while ago, yet every time seems like the first time to them and it's something to celebrate! [Your child is] napping and asleep for a few of the hours you're gone. You're not missing as much as it feels like (even though, I know, you're still missing things -- this is just something I like to remind myself). You probably already do this, but pictures and texts throughout the day are great. I have made it really clear that there's nothing I don't want to hear about, and nothing is ever 'interrupting' my work day or bothering me. You can cram so much love and interaction into those two weekend days, really (but no pressure to like orchestrate fun allll the time, just hanging around the apartment is so great). We have outsourced as much of the errands/chores that we used to do on the weekends as we can so that we can spend more time just being a family. If there's something you really want to be the first to do with her -- for me that was the swings -- just make that clear to your nanny and do it on the weekend. If there is something special during the week that you can miss work for sometimes, it is worth it. Example: my boys go to a class on Wednesday mornings with the nanny and my husband (when he can make it, which is most of the time) and he loves it. “It’s so so hard, and it really does get better. It gets easier. It’s so hard to believe people when they say that but it’s true. I remind myself that I am the one there for her every night, and every wake up, and every middle of the night crying cuddling need. She will have all sorts of different teachers throughout her life who will be with her during the day, and they will change (Nanny to preschool to 1st grade, and so on...), but you are her MOM. It’s like work - I spend all day with these other people, but my family is my family. I agree about the work from home thing, if you can do even once every other Friday it will feel better. I found we love our nanny so much that I have felt grateful for the things she has brought to our lives! Like potty training! “I had the very same feelings and still do. I try to remind myself that it "takes a village" and perhaps before modern times, groups of women/men were sharing the children-rearing more. And maybe this idea of "co-mothering" is positive. More love for my son. Another culture to be exposed to. I also think about my mom who was a stay-at-home mom, but also didn't have the time or the know-how for self-care and was depressed being a bit isolated. It's not always ideal the other way around. Not that I would repeat this pattern had I stayed at home. What's helped me is accepting the fact that our nanny is my son's main caregiver (and thus deserves the very best of treatment). We joke (but it's true) that our nanny is rank No. 1 in our household (son is No. 0) and then it was me because I breastfed (but now I've been relegated to my husband's level!). Although pumping is so hard and annoying, breastfeeding helps. If you can't pump at work, just doing it directly in the morning and evening helps in my experience. Agree with [a previous poster] that co-sleeping helps, although it's not for everyone. Also agree that moving bedtime to later helps (but would really depend on the kid - some kids end up waking up too early if bedtime is too late for the kid). “First, as a practical thing during the day when you’re back, it’s fine to encourage your nanny to encourage your child to nap twice during the day – aka as much as they want. If you can deal with the sleep deprivation you can time shift. For MANY years my son was up at 6 a.m. or earlier and went to bed at 9 p.m. or later (even as a baby) and so I’d spend 2-3 hours with him morning and night and all weekend and I’d be exhausted but not feel like I was missing time with him. Some babies sleep more than others. My son only had a bedtime before 9 when he gave up the 2nd nap at around age 2 and couldn’t make it that long, and went to bed around 8. Then there was the point where he was ready to give up all naps so was up till 10 p.m. nightly, which was great but tiring for us. I also nursed till he was one year old or so, so he would nurse early in the morning and at night and on weekends, which also helped me feel closer while working. (he didn’t want to wean when I was ready, but that’s for another thread) If your baby needs to go to bed at 7:30 and you get home at 6:30, that might be another story. See how it plays out? 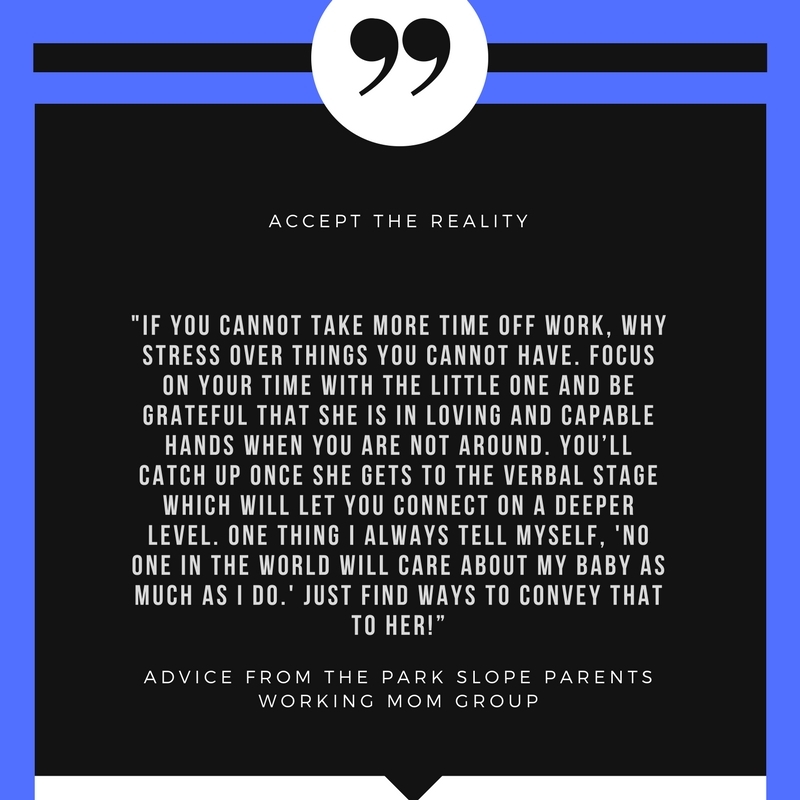 I also suggest that you both lean in to going back to work AND keep asking yourself how you feel about being away for chunks of your baby’s days. 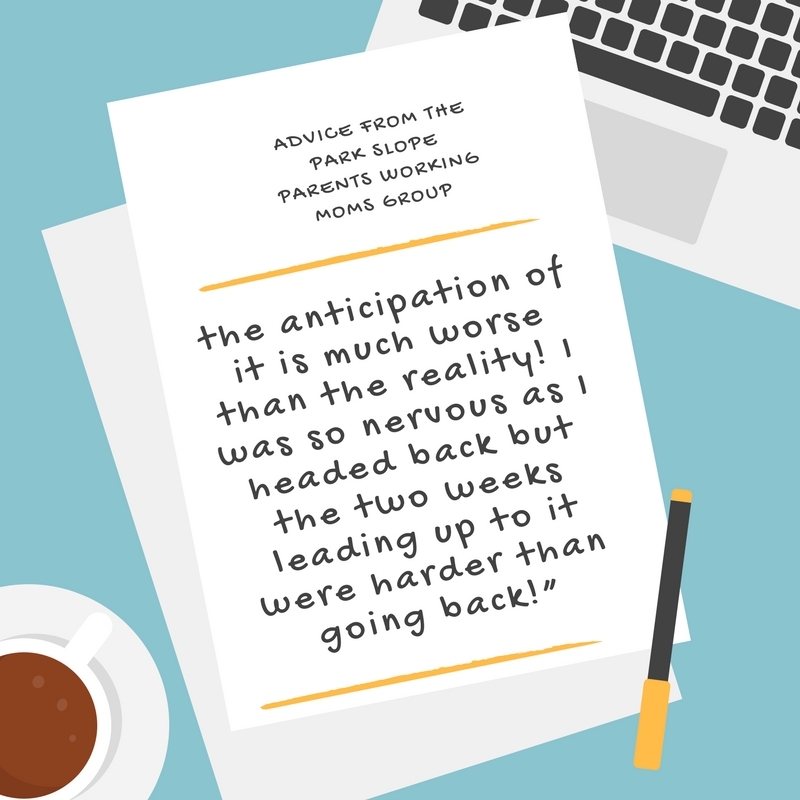 Your viewpoint will probably change dozens of times in upcoming weeks and you may settle on NOT wanting to miss it and needing more time with your baby. Or you may relish the time you’re at work and find it easier than being a full-time caregiver (or even a part-time employee). I struggled a lot with this stuff and for me, in the end, I liked continuing to work. But it could have gone the other way and almost has off and on over the years. There’s also the practical aspect of, we live in NYC and many families need two wage earners. If you’re a single parent then presumably your earnings would be higher than what you pay your nanny so it may just be practical for you to keep working. It was for me, although I sometimes would step back and figure out what the net costs were of not working and whether they allowed us to remain in NYC or would require a move to a lower-cost area. I work from home Tuesdays and Fridays, so I went to singalongs and spent a lot of time with them then. But it was also really nice not being the primary caregiver during that time. Now that they're 13 months, I actually don't go to singalongs anymore (except the one I host in my apartment). I had to work from home during my 3rd trimester because I was too big to go in, so my boss knew that I'd still be productive at home. I would try to use that as an argument to get some days at home. I'm not sure why, but I'm fine missing the "firsts" because the first time I see something is already pretty exciting. When my nanny told me that my girl (I have b/g twins) started walking, I was really excited to see it, and when I saw it, it wasn't less special. I also changed the way I see my nanny - she wasn't raising my children, we were doing this together and I didn't have any negative feelings about that. I really appreciate that she is a true professional and is much more detail oriented than I am. There have been times that my kids have had marks/bruises/scars on their face that I didn't notice all day and she would come in and immediately say, "what happened to his face?" It felt like they were in better hands with her than with me, and she took them out way more than I would be inclined to if I were at home with them. I know this is a tough phase and I'm wishing you the best through it. “It’s always so heartening to hear everyone say they had a similar experience! When [my child] was three months old I went back to work 3 days a week and then a month later I was back up to full time. I often tell people that the transition from 3 days a week to full time was the hardest for me. Not to have any downtime to squeeze in all those things I didn’t manage to get done on a day I was working (putting that load of laundry on, exploring a new park or just enjoying spending time together). Let’s just say there were a couple of nights of tears and frustration as I tried to figure out that new routine and learn to let some stuff go. I totally agree with all the suggestions of trying to work from home one day, although if your little one is anything like mine I don’t get much done when I WFH and he isn’t at nursery. Also, in terms of firsts like starting solids or changing feeding times it’s your call when to start it, what to start with and whether you want to go the baby-led weaning route or not. So even if your Nanny is doing the day shift you’re still setting the path for her growth and development. And I agree on the suggestions to start new things on the weekends or maybe with dinner or breakfast if you are able to do those meals as well as getting pictures during the day. Honestly, the app my nursery uses with the photos is the biggest thing to control my sanity even now he’s been there for almost 6 months. “Is there any possibility you could work remotely one day per week or ask for a flex schedule? Any bit of extra time with your child will make a difference. I have a 4 day/week schedule that allows me to see my daughter more and although my career advancement is unfortunately on hold as a result, it was well worth it to me. I know this isn't an option for everyone, though. “You asked "how do you do it?" Well the good news is - you're already doing it! You're a working mom 3 days a week! Give yourself MAJOR credit for that! I also third the comments that the anticipation of going back to work full time was way worse than the reality. Take things one day at a time and be gentle with yourself. There will be good and bad days both at work and at home (but there were before you had your daughter). 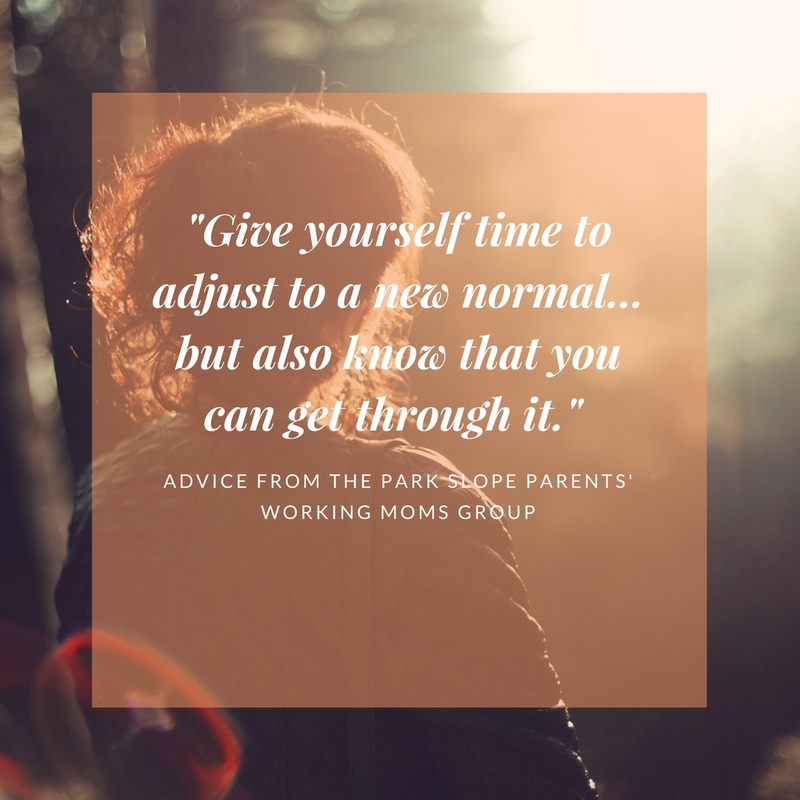 Give yourself time to adjust to a new normal, take all of this advice but also know that you can get through it. “You need a pep talk so here it is. None of us is this perfect mom 24 hours a day. Motherhood is not an idyllic utopia. The singing, the teaching etc is also interspersed with crying and spit ups and laundry. A lot of full time moms are exhausted and indeed checked out. I can honestly say I was an awesome idyllic mom the time I was with my kids. I sang. I fed. I read. I hugged. But I could only be so awesome and present as it was a couple of hours a day and weekends. So working allowed me to be a better mom than if I was a full time mom. So think about quality not quantity. I am not sure of your financials but for me thinking of all the opportunities my kids have because of having 2 working parents took a lot of the guilt off. “Outsource every chore possible so that you can make your time together really count. For us it meant a cleaning person and grocery delivery, items that ate away from our weekends when I went back to work with my #1. Make fun plans with your baby - brunch, trips to the museum, playground when it gets warm, baby concerts (check our Brooklyn Bowl kid series). “I second Megann who said that your first time seeing it is the first time. I suspect that my first child first let out his first laugh with our nanny but she never really told me out of kindess. So when I saw it for the first time.. it was magic nonetheless. Our nanny was also incredibly good at making our son excited/happy about every time I came home, so I always felt so welcomed and missed (in a good way). I had nannies, babysitters and caregivers growing up. But mom is mom and mom is the best -- and I was never confused by that; and I dont think your child will be. 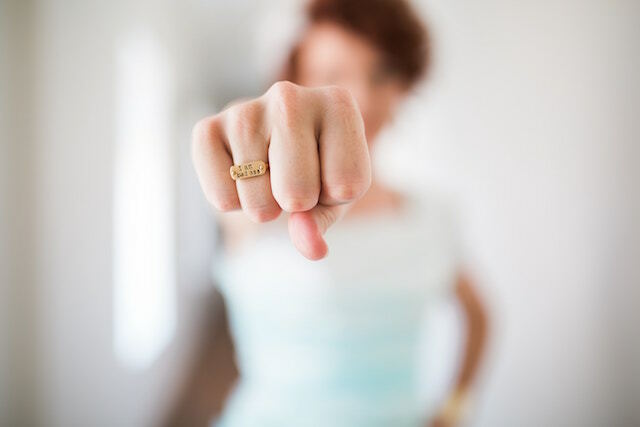 In fact, because I get huge breaks from my kids while I am at work... time where I am dressed professionally, talking to grown-ups, able to fulfill a separate part of myself -- I find myself more present, excited, and engaged in my interactions with them early morning/at night/during the weekend. I've met at least one SAHD who feels guilty because he's not all there when he's taking care of his kids because he misses his professional/personal time.